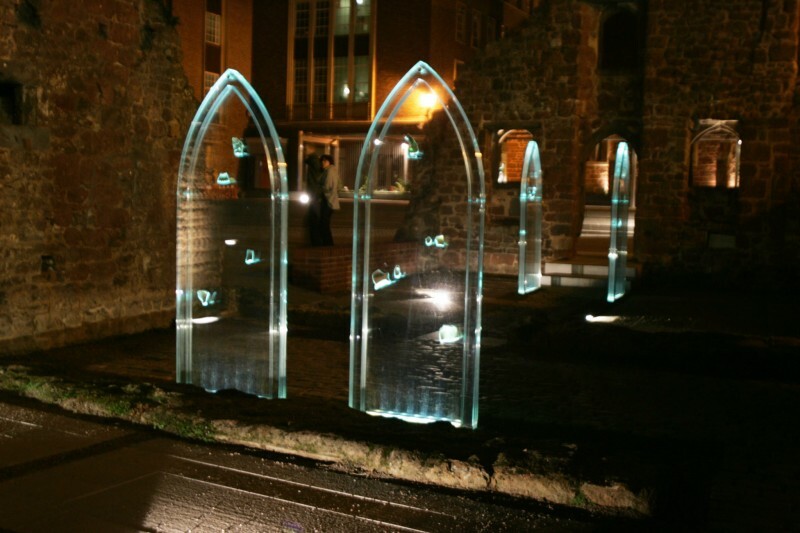 Marking Time (2003 – 2005), was a series of permanent installations on the site of an Almshouse, a listed Ancient Scheduled Monument built in 1450 in Catherine Street, Exeter. The site was bombed during the war. 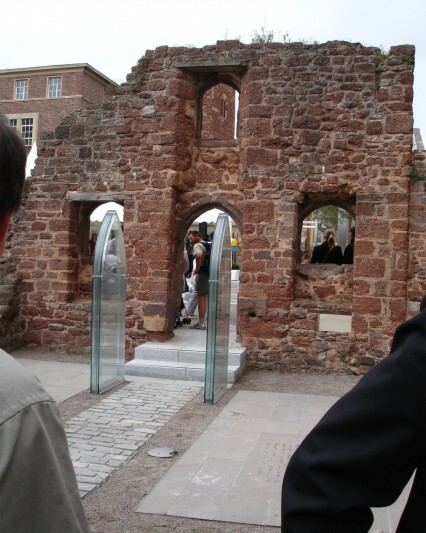 My project was part of a £350,000 public art programme and a £235 million regeneration scheme commissioned by Land Securities, Exeter city council and English heritage to create an improved setting for one of Exeter’s most historic landmarks. Marking Time has been described by the Association for Heritage Interpretation as a ‘high quality site-specific art work.” and as “Pushing Boundaries through the use of technology, interpretation, public intervention and drawing attention to the facts”. The work has been cited in several publications and academic journals. David Littlefield in his book Architectural Voices: listening to old buildings, describes architects as “performing surgery’ …restoring … elderly buildings.” Marking Time is the only example he uses where the intervention has been a creative response rather than simply preserving a historic structure. The Winston Churchill Fellowship report describes Marking Time as playing “a significant role in the restoration or interpretation of heritage building” and “conveying to the public an understanding of culture, history and a sense of place” Marking Time won an IALD international lighting Award of Merit in Las Vagas, USA in 2008 for the lighting in collaboration with Martin Lupton and Mark Ridler. 160 projects were submitted and 23 were recognized with awards. I worked closely with the design team architects: Chapman Taylor and Panter Hudspith ; the lighting designers, BDP Lighting; the archaeologists; Richard Parker; the Phoenix Art Centre; Archivists, Mrs Doughty of Exeter Cathedral; the Landscape architects, Wilkinson Eyre and the Project manager; Sarah Collicott of Artscape Management. Marking Time evolved over a period of three years. The research took me on a historical journey through archives, uncovering information and scrutinising physical clues to find out details about individuals who had once lived in the almshouse and the neighbouring Canon’s house. 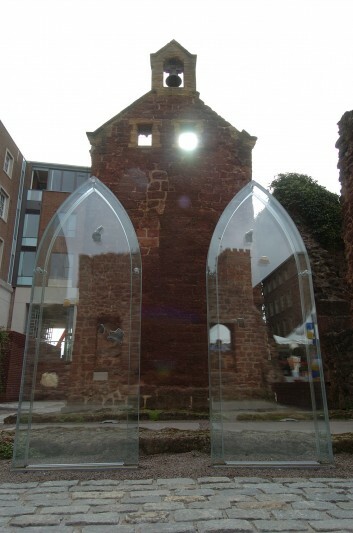 My intention was to excavate the Almshouse through time, focusing on the ordinary and the minutiae of everyday life on this historic site, uncovering layers of history and opening up the space to the people of Exeter. I wanted the positioning of the artwork to offer visitors a historical and social overview of the site. My initial research revolved around issues of homelessness; I was invited to make artwork in response to a site that had housed the needy from 1457 until it was bombed during the Second World War. Alms-houses have existed throughout England providing institutional poor relief to homeless men and women for well over a thousand years. Today houses which were founded during the sixteenth and seventeenth century continue to operate in much the same way as they did four centuries ago, often in the same buildings. My research led me to consider today’s social and economic situation for the homeless and allowed the artwork installed within the alms-house to speak about some of the mechanisms of control and poor relief offered to those who once occupied the space. The layout was extremely simple; the floor markings identified the layout of small cubicles that would have offered basic accommodation for residents. 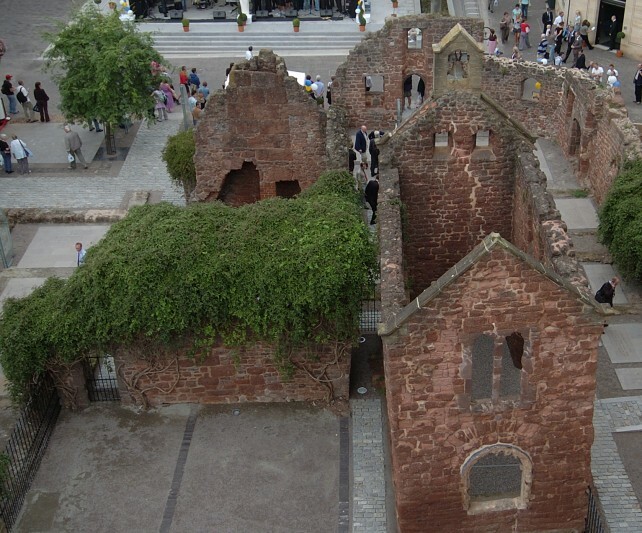 There was also a chapel that still stands to its full height without roof or windows. The site is dominated by the Canon’s house that was of course three to four times larger than the living quarters for the alms-folk. I discovered that at the time of making the artwork 77,940 households in England were living in temporary accommodation, including over 12,000 in bed and breakfast hotels. Families accounted for more than half of these. A report by Crisis gave a figure of 400,000 people living in hostels, staying with friends or living in other temporary places. (Diaz, R. 2006) Housing and social services departments were instructed by a Government Commission to address the support needs of vulnerable people within their communities. Ironically, at the time of this commission the Exeter Alms-house was being used unofficially as a place of shelter for homeless individuals. 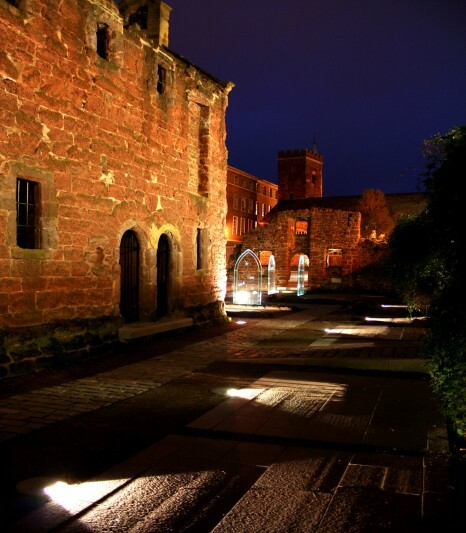 The council saw this as a major issue as the Alms-house was located within a main tourist area. 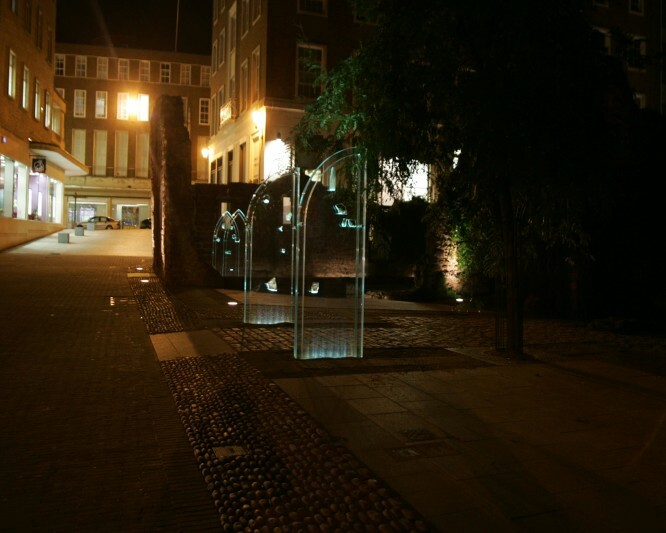 The council initially wanted to commission an artist to create a purely decorative barrier around the Alms-house to ‘keep drug users and vagrants from entering the historic monument’. My proposal was to illuminate the space and make it a much more appealing space for visitors that was more ambitious than simply pushing the homeless out of the Alms-house. 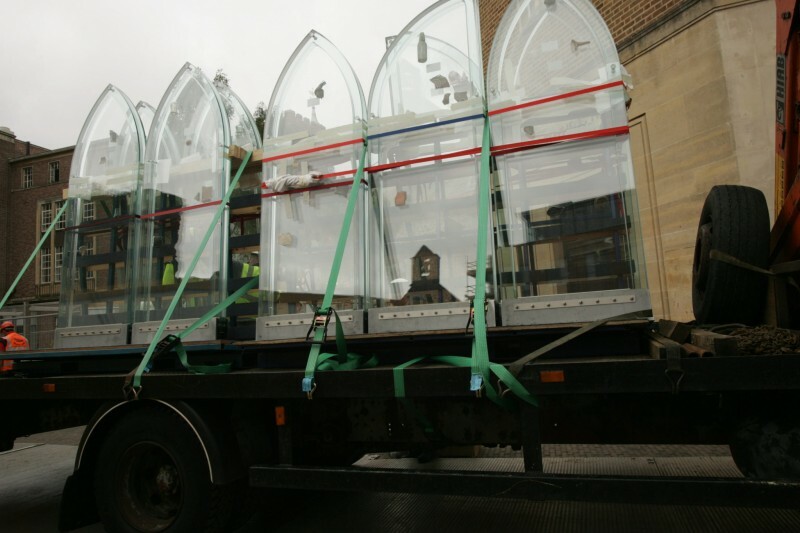 My initial research began with a visit to St Petroc’s, a homeless charity about a hundred yards down from the Alms-house, to find out more about the issues of the homeless in Exeter. The charity does amazing work for the homeless and this is nationally recognized. clients have to agree to. This contemporary notice was similar to the conditions that had to be agreed to in order to live in the alms-house hundreds of years ago. Unlike for the fifteenth century alms-folk, praying wasn’t on the list of conditions but still the benefits came with conditions. It seems that, through the centuries, the homeless have been supported only when they conform to strict behavioural standards. The different strands of the artwork combined to give a sense of continuity to this historic site so that the story of long-forgotten residents was brought to life in language, archaeological finds and the light and texture of the glass doors. 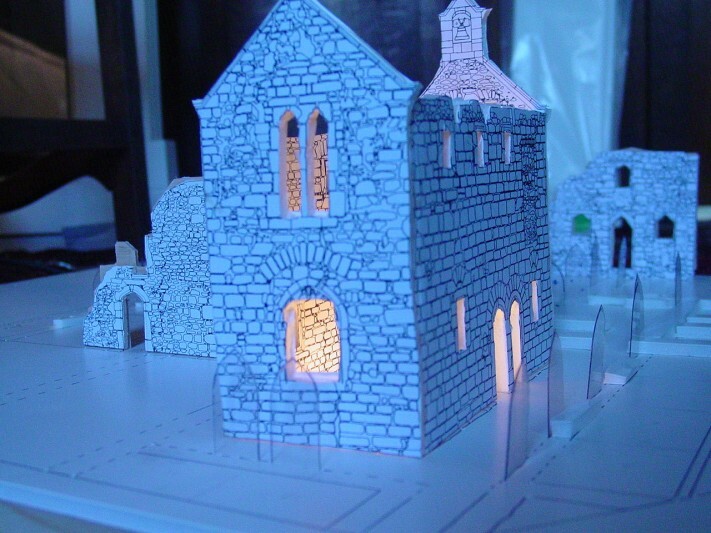 The development of the artwork for the Alms-house involved long periods asking questions, delving into historical documents and talking to many people with specialist knowledge of the historic monument. 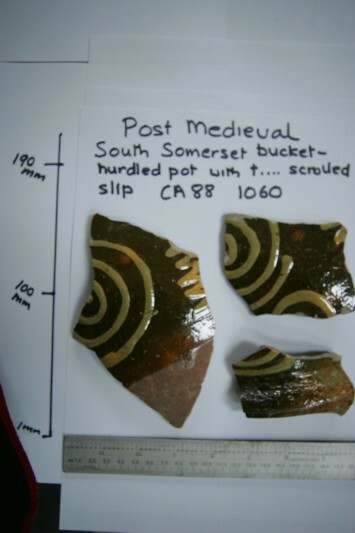 This collaboration involved learning from experts in many other disciplines – archivists, archaeologists, librarians, architects and landscape architects as well as local historians. The history of the site meant that there was a rich and subtle atmosphere to the space. The research took me on a historical journey through archives, uncovering information and scrutinising physical clues to discover details about individuals who had once lived in the Alms-house and the neighbouring Canon’s house. 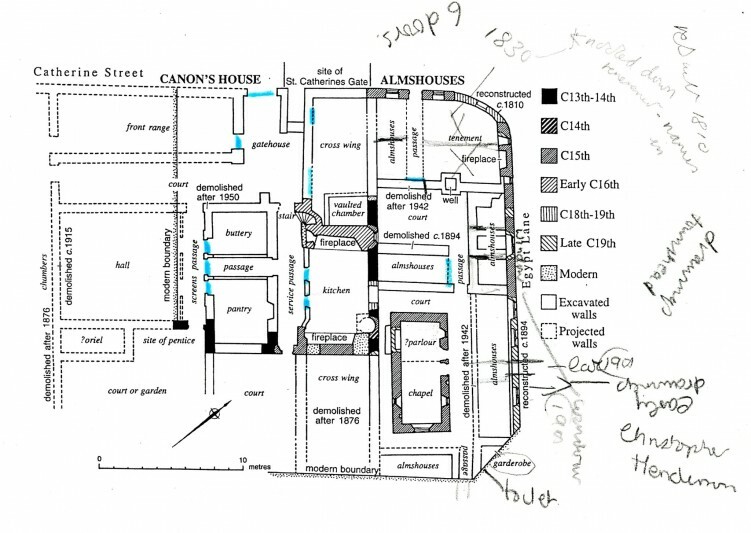 Viewed from above the site, I could see the layout of the rooms – I noted a definite inequality between the living space of the Canon’s house and that of the alms-folk. I wanted the glass doors to illuminate this difference in occupancy. 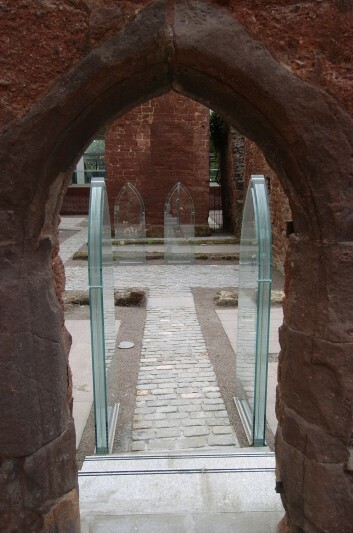 The glass doors were reconstructions of the original medieval doors and positioned in the exact place of the original medieval doors. 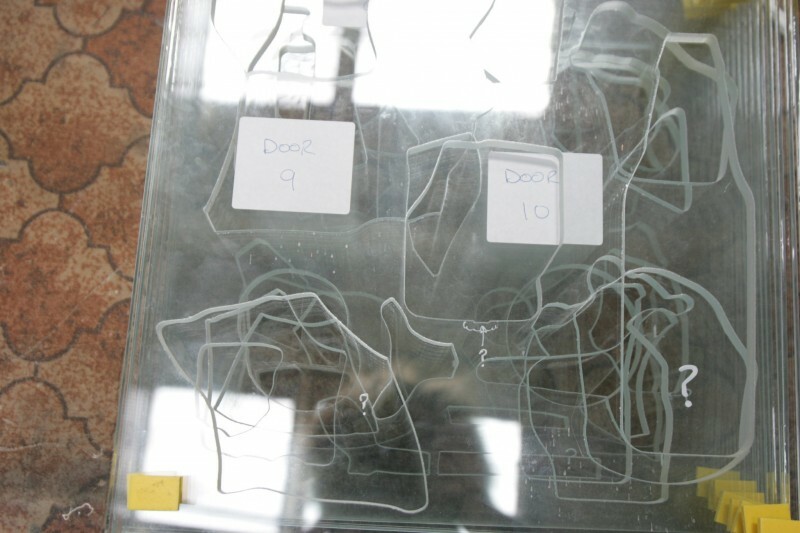 Within the doors were archaeological finds from an on-site dig that took place in the 70s. 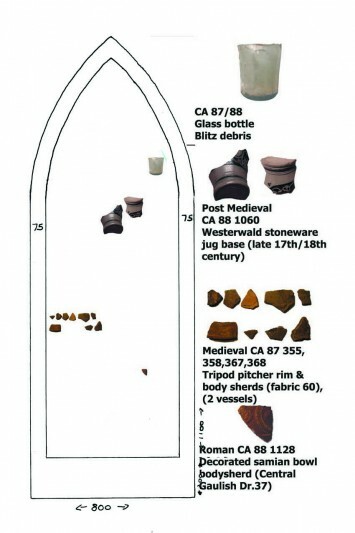 Each find was then cut into an inner glass section of the door, at the location and strata level where they were discovered under the ground. The work and ideas were generated by spending months getting to know and collaborating with archaeologist Richard Parker in his work space at the Phoenix Art Centre. I observed his detailed and concentrated work process working with finds and the production of detailed drawings – that he explained as simply ‘mapping time’. The formal term used by archaeologists is ‘stratigraphic sequences’ or better known as the Harris Matrix developed by Harris, an archaeologist who in 1979 described this as ‘seeing time’ within a site. This idea resonated with me and acted as a catalyst for what I wanted to achieve on site with glass, text, lighting and archaeological finds. By encapsulating the archaeological discoveries in their original locations, I would hopefully offer visitors an experience of journeying through time and place. 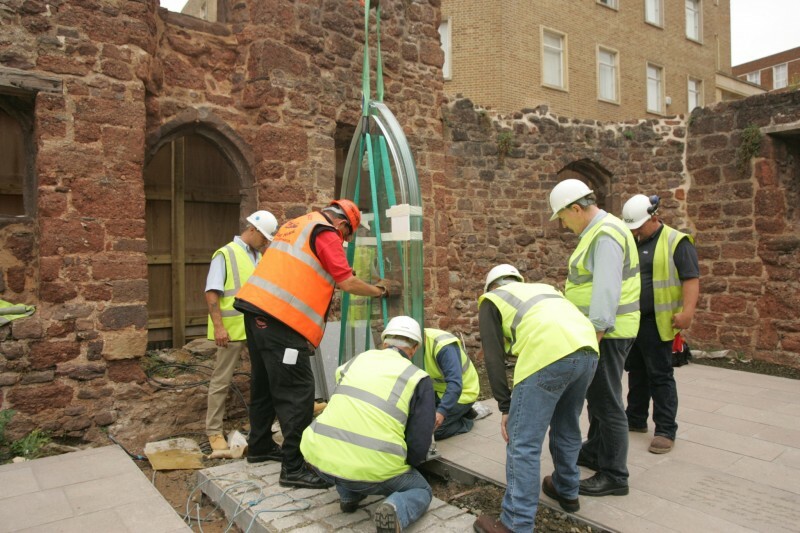 I was aided in accessing this information by the fact that I had already formed a strong working relationship with Richard who not only had an abundant knowledge of the history of the Almshouse but was passionate about bringing the significance of this listed ancient monument to public attention. Richard was, for me, a major gatekeeper in allowing me access to vital information, historic documents, permission from English Heritage to use the finds in the art work, and ensuring I knew exactly where the medieval doors were originally situated. I wanted to transfer text onto stone and spent hours searching through archival documents (e.g. chapter act books, records of monetary transactions for repairs) as well as locating and photographing specific texts. I believed that by using personal handwriting, individual’s names and specific events, that these would offer a human connection with those who once lived or worked in the Almshouse. 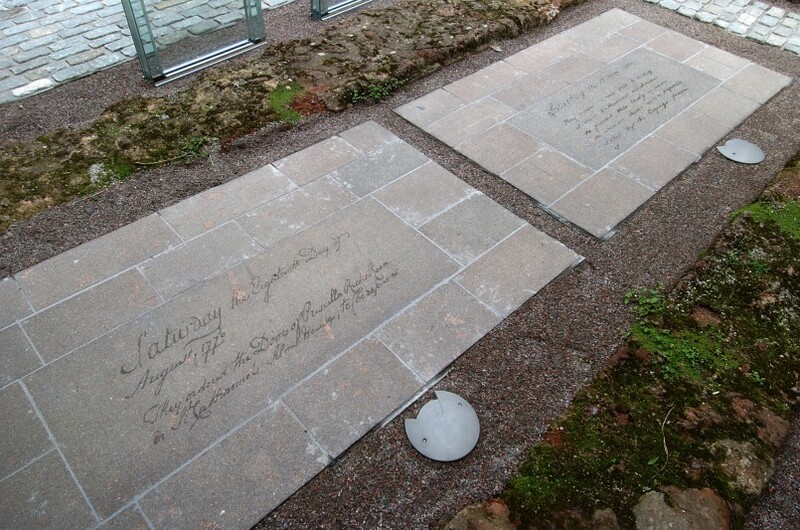 Katie Melville Livingston Ayres, a landscape architect worked with me to identify the paving stones as a surface for sandblasting text and I worked with Hour Glass fabricators to produce the glass door structures. 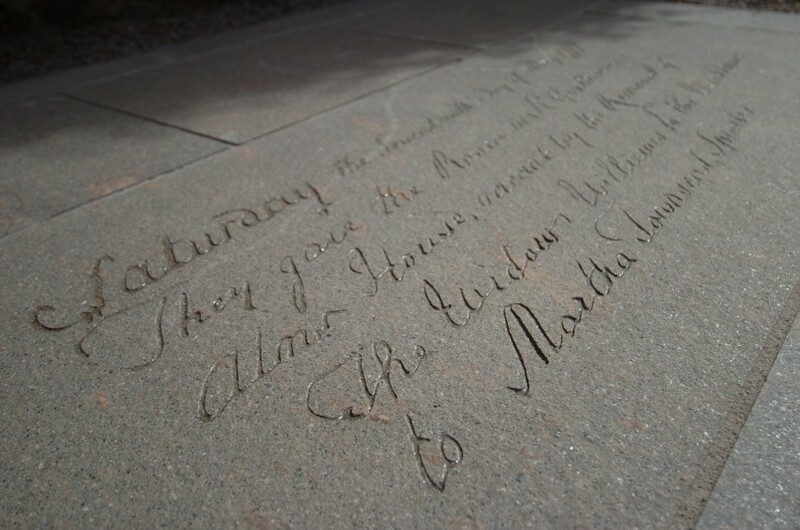 The handwriting was transferred into a vector file and the text was then sandblasted directly onto the porphyry stone slabs. 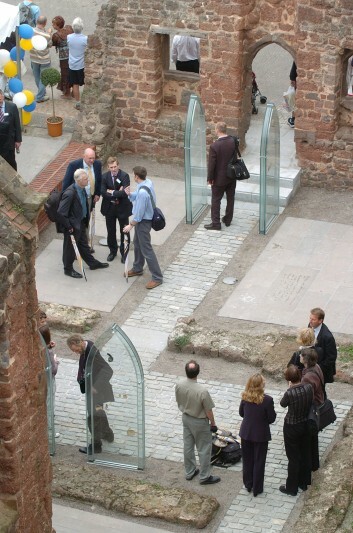 The porphyry slabs were positioned on site and mapped out the floor areas of individual spaces for alms-folk. The text would have a specific association with a particular room, activity or person. 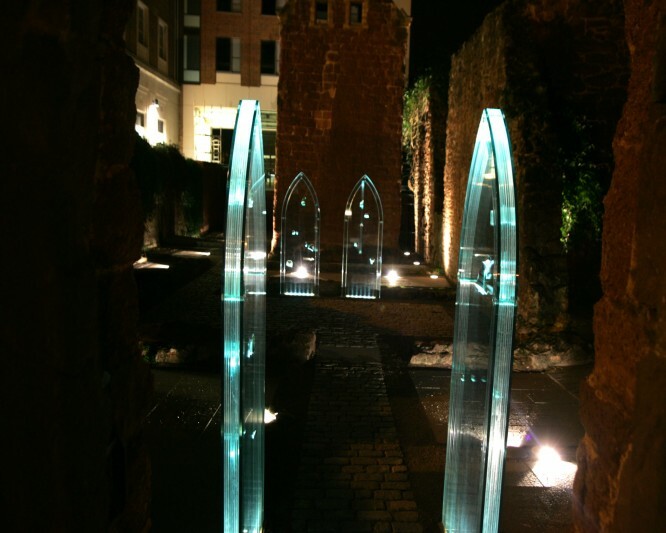 At night, I wanted to create the illusion of the finds floating within the glass doors and BDP lighting designer, Mark Ridler, suggested the use of fibre optics at the base of each glass doors which would work as long as each find didn’t overlap and block out the single ray of light.